I thought I’d tell you about where I grew up. I don’t think I have before, which is a shame, as it really was a fine place to be. I was born here in Canada, in Montréal, Québec to be specific. We moved to southern Ontario when I was a toddler, and it’s where I did almost all of my growing up. When I think of this place, I think of its geography. On one side we had Lake Ontario. It is broad and blue, and, depending on where you stand, without end on the horizon. The escarpment, a rocky outcropping that carves a jagged, irregular zigzag across the map, is to its opposite. In between and all around were fields, orchards and vineyards, with their imposed geometry of pattern and crops on the landscape. Then there was the river. The Niagara River flows between Lakes Erie and Ontario, over its eponymous waterfalls and a breath-stealing gorge. Over that river, across that expanse that feels so big the air between feels solid, is a whole other world; a whole other country, in fact. That’s the thing about living in a border-ish town. There’s the false familiarity of proximity with the simultaneous awareness of difference. The feeling of sameness although not quite there. We share a lot with the United States; television stations travelled the airwaves without minding the division between us, same goes for radio. With Buffalo, New York a short drive away, I grew up with an adopted local pride (and accompanying expertise) for the distinguishing aspects of the classic hot chicken wing. There were, of course, differences. And to a six-year-old, these were important ones. They had Apple Jacks and Cinnamon Toast Crunch cereals, for starters. And Jiff peanut butter. We had ketchup-flavoured potato chips and (sometimes) poured gravy on our fries. Many of these disparities have disappeared in the years passed from my childhood and now, but we still spell colour and favourite with a “u”, call it Zed and not Zee for the last letter in the alphabet, our packet of ketchup-flavoured chips is emblazoned with both English and French, and we’ve got Butter Tarts. Nanaimo Bars, too. For those who don’t know, butter tarts are basically miniature pecan pies without the pecans. Gooey, dark and the antithesis of subtle in its sweetness, the filling may include raisins or walnuts, but the inclusion of either is the subject of impassioned debate. Nanaimo Bars, a bar cookie named after a city three time zones and 4,500 kilometers away in British Columbia, are more difficult to describe and, as far as I know, without compatriot in definition. In the way I learned to make them, you make a crust out of cocoa powder, butter, egg, graham crumbs, shredded coconut and chopped nuts (walnuts or almonds being the most trad). It’s baked until just firm and slightly crisp. I’ve recently found that other recipes cook the mixture on the stove top, with it then pressed into a pan and chilled to set. Whatever way you make the crust, upon it you spread a concoction that’s often mistakenly-described as a custard filling. What it is, in actual fact, is a custard-flavoured icing - thanks to the brilliance of powdered vanilla custard powder. It sounds strange, and maybe it is one of those things you have to grow up with to understand, but frosting, rather than the smooth eggy tenderness of custard, is imperative for its grittyness. It is all about the specific feel of sugar and powdered custard creamed into butter. You see, there’s ganache yet to be poured over the whole pan, and it is the texture of the custard icing that stands up to that of the chocolate. Their consistencies almost match, so that when bitten, the chocolate gives way to the filling without clear definition against the tooth. Not to fear, the stick-to-your teeth quality of those two components is cleanly cleared by the coarse crust below. Really, they thought of everything. It has been a long while since I’ve had a Nanaimo Bar; they went through a popularity boost in the mid-90s right when everyone was watching Friends and drinking lattes at coffee shops. Around then, you’d find Nanaimo Bars on the counters at said coffee shops, with radical frosting flavours like Irish cream, cappuccino and mocha. But then along came Justin. Justin Schwartz, if you don’t know already, a singularly-swell individual who shares my affection for Alice Medrich’s recent book, Chewy Gooey Crispy Crunchy Melt-in-Your-Mouth Cookies. He’s been baking from it, and we’ve been chatting about it, and we got on the subject of the No-No Nanaimo Bars found, fittingly, in the Gooey chapter. He’d not heard of Nanaimo Bars, and I of course had but was curious about the cheesecake-ish filling Medrich offers in lieu of my trashy-but-beloved custard powder. He made a pan and deemed them a revelation, which was just about all the encouragement I needed to do the same. Justin is right, these were intensely good. I’ll add the asterisk that they're especially so straight out of the freezer - they won’t freeze solid, and so end up with a good share of the charms of an ice cream sandwich. But, I will say, with allegiance and fidelity held firm, and as both Justin and Medrich herself note, these are not Nanaimo Bars. The cream cheese adds a new dimension, a refined edge of sharp dairy, that is a departure from the original. Dare I say, the dowdy bar is elevated to a place verging on elegant. While something special in its own right, and with great respect to all those involved, I’ll hold tight to the false-yellow stripe of frosting between my chocolate and crust. I've got a predisposed allegiance to uphold. Custard powder in our cookies might be a Canadian thing. As far as traditions go, I'll stand on guard for thee. The latest issue of UPPERCASE magazine is out! Here's a preview of what you'll find in the Sweet column for winter; we're extolling the virtues of the small and making mini doughnuts. There's also been some exciting news that has had me grinning for days. The first annual Canadian Food Blogger Awards were announced last week, and was wonderful to see so many friends on the list of nominees and winners! The judges saw fit to include me on that list, nominated for photography, and winning in the categories of writing and recipes. It is an honour and my gratitude goes out to all those involved. I feel a wee bit of stage fright on the mention of this one - a week ago I was on CBC Radio One's Metro Morning talking food and blogs. If you'd like to take a listen (be kind!) the podcast can be found here, with our segment beginning at around the 13:30 mark, and I first speak about a minute later. It's been a good week. I hope yours has been too. Thanks for sharing all of this with me. 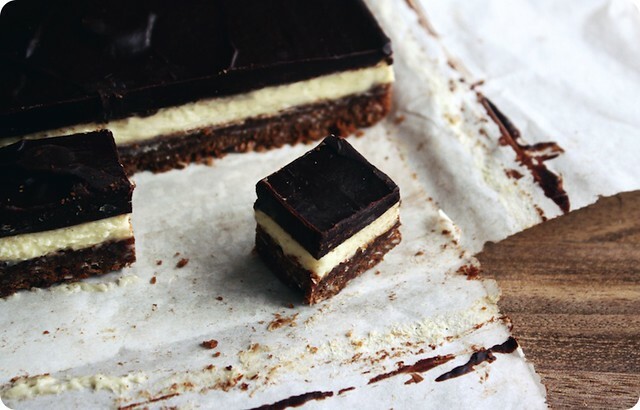 Named after the city in British Columbia, the traditional Nanaimo bar is a no-bake layered affair with a crumb crust and layers of sweet vanilla filling crowned with chocolate. These here — with a coconut pecan crust, vanilla cream cheese filling, and dark chocolate ganache — are for people who like the idea of the Nanaimo bar but wish it were different: less sweet, more grown-up, a bit modern. Oh, and these are baked. Thus, no claims to authenticity…only a very good bar created by a very good friend, Portland food maven Maya Klein. Excerpted from Chewy Gooey Crispy Crunchy Melt-in-Your-Mouth Cookies by Alice Medrich (Artisan Books, 2010). Mix the crumbs, coconut, pecans, butter, and 1/4 cup of the granulated sugar and pat it very firmly into the lined pan. Bake the crust for 10 to 12 minutes, or until it looks slightly darker at the edges and smells toasted. While the crust is baking, mix the filling. In a large bowl, beat the softened cream cheese, brown sugar, and 1/4 cup of the remaining granulated sugar until smooth. Beat in the vanilla and then the egg. When the crust is baked, dollop the filling onto the hot crust and spread gently with the back of a spoon. Bake the bars until the edges are slightly puffed, about 10 minutes. Cool on a rack for 30 minutes. Chill for at least 2 hours. Dissolve the remaining 2 tablespoons granulated sugar in the cream. Bring 1/2 inch water to a simmer in a medium skillet. Coarsely chop the chocolate and combine with the cream in a medium metal bowl. Place the bowl directly in the skillet of hot water and turn off the heat. Let rest for 5 minutes and whisk until smooth. Set aside until needed. Pour the warm ganache onto the bars, spread, and chill for at least 30 minutes before serving. Lift the bars out of the pan by using the edges of the foil liner. Cut into 16 or 25 squares, wiping the knife between cuts. May be stored in an airtight container in the refrigerator for 3 to 4 days. Makes 16 large (2 1/4—inch) bars or 25 smaller bars. When I first begin to get sick, I begin to clean. Ambitiously. It's not just scrubbing dishes or sweeping the floors or folding the laundry. It's cleaning the windows and flipping the mattresses and vacuuming under the fridge. When my mind is fuzzy with sickness, I can't stand a similar feeling of clutter in my surroundings. It drives me bonkers. But at least, in the best of circumstances, my fits of crazy result in cookies. Last Tuesday I organized the closets. Most specifically, the Closet We Dare Not Open. That's the closet in our little den, a stash and dash repository, the closet that still had sealed boxes from when we moved to this house two years ago. Yes, you heard me right. Sealed boxes. And yes, it has been two years. Don't look at me like that. You try moving with a toddler when you're already expecting your next and let's see how well you do in getting all your boxes unpacked. Ahem. Now that we've thrown open the quite literal door on my secret shame, back to the present. And those boxes. These were the boxes of nonessentials - the last boxes we'd packed from our previous house, thrown together as we made our way out the door. In one I found a storage container (empty) for CDs, an unopened package of paper, a sketchpad and some dice. In another, pictureless fames and ice cube trays. And in another, I found my recipe notebooks. The pair of books, pale slate with Prussian blue trim, date back even further than the move to this house. They are from A Time Before; the time before a ring had ever been put upon my finger and before my child had ever been placed in my arms. A time before I started writing here. My Mum had recipe folders when I was growing up. She'd snip out and tack in recipes from magazines and newspapers, these interspersed with handwritten cards bearing the bosom-held secret recipes of family and friends. Hers were fat and full with both the memory and the promise of delicious meals. I was ready, at least recipe-wise, for Sort of Life I was Going to Lead. My books were as much a compilation of tried recipes as it was of the recipes I wanted to try in that future. I was going to be prepared. Prepared for everything except baking cookies. In curating these books, I overlooked cookies entirely. Filled anticipation for future dinner parties that would surely require an elegant sweets course, I hopped, skipped, and jumped my way past biscuits and wafers and biscotti. The closest I come to a cookie is the solitary mention of brownies. I think I thought that cookies were dull. I know. I was young and stupid. Cookies were one of the first things I'd learned to bake, due in large part to Mrs. Wakefield and those bags of morsels, and I believe I had the fool idea that adulthood was the time to move on from such childish pursuits. Thank goodness for being lazy. And in love. I started those books years ago, but I never finished them. They went into the back of a closet, moved from apartment to apartment to house to house, untouched. Instead of collecting, I started cooking, and the next thing I knew I was here. And the person that is here is a mum who bakes cookies. Often. A move to rectify the lapse in those books' the cookie section is long overdue, and I have already got my choice for the first one in. These Chocolate-chunk Oatmeal Cookies with Pecans and Dried Cherries are sigh-inducing balance of sweet, salty and subtly sour. They are speckled and nubbly, with a crisp rim and a soft centre, and deep cracks that travel their surface. And oh my stars, they are perfectly delicious. So delicious that they deserve a fan club. We can have the meetings at my place. Once I'm done cleaning. From Cooks Illustrated published May 2005. In the bowl of a stand mixer with the paddle attachment, or with a hand mixer, cream together the butter and sugar on medium speed until light and fluffy, scraping down the sides of the bowl as needed. With the mixer on medium-low, add the egg and beat until incorporated. Scrape down the sides of the bowl, turn the mixer down to low, and add the flour mixture to the bowl. Stir until just combined. 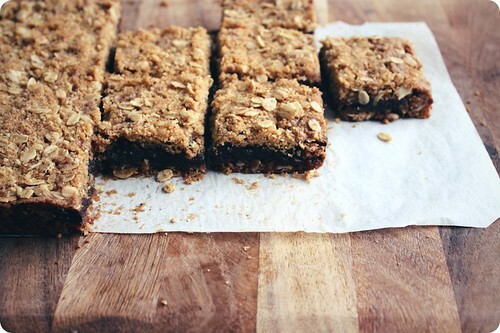 Finally incorporate the oats, nuts, fruit and chocolate. Do not overmix. Turn off the mixer and use a rubber spatula to give the dough a final stir and make sure that all the ingredients are incorporated. Using an ice cream scoop to measure 1/4 cup portions of dough. Roll these portions lightly between your hands, then place 8 on each baking sheet, spaced evenly. Wet your hands and lightly press the dough to a 1-inch thickness. 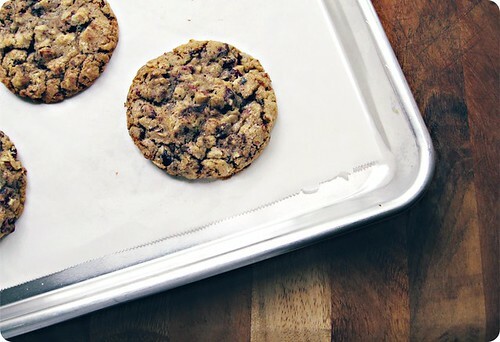 Bake the cookies, two trays at a time, in a preheated oven for 12 minutes. Rotate the trays top to bottom and back to front and bake for another 8 minutes or until the cookies are uniformly golden, but still wet in the middle. You might think that they're undercooked, but you're wrong - resist the urge to overbake, they will set up further as they cool. 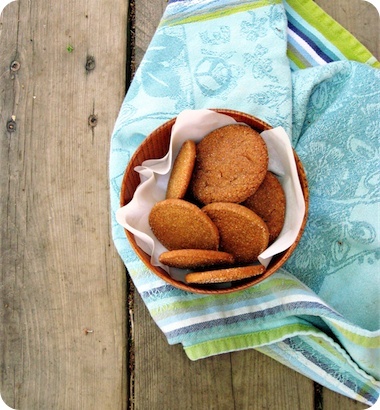 • Although the original recipe specifies table salt, I used kosher salt instead; I enjoy the uneven saltiness of kosher in cookies, but that is only a personal preference. • Continuing on the topic of salt, I sprinkled the pecans with some fine grained sea salt when they were toasted. This subtle salinity hummed steadily beneath the complexity of the chocolate and cherries. • Wanting a slightly more modest cookie, I divided the dough into 24 and reduced my cooking time accordingly.